When In Pursuit Of Positive Change, Better Drop The 'Why Me' NPR's Michel Martin wonders: Why do so many of America's would-be leaders — from across the political spectrum — speak in the language of resentment rather than opportunity? 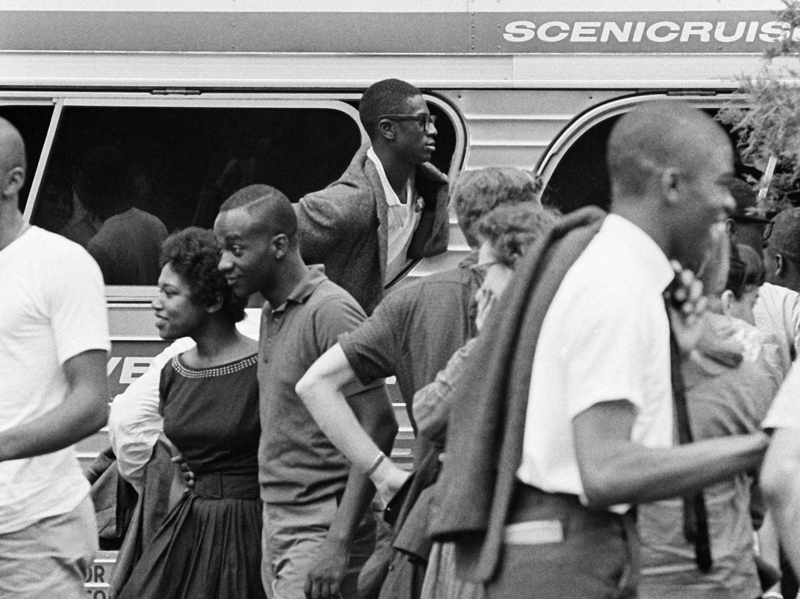 An unidentified Freedom Rider sticks his head out of a chartered bus window in Jackson, Miss., in August 1961. Today I was thinking about something one of the Freedom Riders told me a few years ago, when I had the opportunity — the privilege — to interview a group of them. Remember, these were the courageous men and women, both black and white, who rode the Southern bus routes for seven months in 1961 — facing vicious beatings, fire bombs, arrests and jail — all to draw attention to the fact that public facilities were still segregated despite the passage of laws saying it should be otherwise. I was thinking that many of the people who boarded those buses were still very young, in their late teens or early 20s — and if not living under their parents' roofs, were still subject to parental opinion. So I asked them, once they'd made the decision to go, who in their lives were they most afraid to tell. One woman, who was — even in her early 20s — well on her way to becoming a fearless and legendary leader, told me she wasn't afraid to tell her mother, but was actually kind of annoyed at her mother's resistance. And that annoyance made her say something she regrets to this day: "If you had gone," she says she told her mother, "I wouldn't have to." It was harsh, but if you think about it, it makes a lot of sense. Who among us hasn't asked, "Why me?" Whether the task is taking grandma's car keys when she's no longer able to drive or even going to a contentious PTA meeting to challenge an incompetent principal, isn't there a moment when we have all quietly said to ourselves something along the lines of "please take this bitter cup from me" — please release me from the responsibility of having to do this thing that I know has to be done, but I'd rather not do? And yet, why do we ask that? Or more to the point: Why do so many people who offer themselves for leadership right now give you the impression that that's how they feel? Can I just tell you, I know this country has problems, but it's still puzzling to me that the common language of our public discourse right now, uniting the right and the left, is the language of resentment. Contrast this with the language of invention. When do you ever hear people say, "Why didn't somebody else invent the airplane, the smart phone, solar panels, the tea infuser, for heaven's sake, so I didn't have to?" We even have commercials featuring the tiny garages and attics where supposedly this inventing took place. We understand that discovery is a joy that can feel like a physical sensation. In his book The Hunt for Vulcan, about how Einstein's general theory of relativity disproved the long-held idea that there was a planet between Mars and the Sun — the mythical planet Vulcan — professor Thomas Levenson writes that as Einstein cranked out his final computations, Einstein told friends later he felt as if something "snapped" within him. He was "beside" himself with joy. Well, of course there's a difference between toiling alone in your attic to invent the next big thing and getting your head bashed in by racists to make your country a better place. But short of that, if those offering themselves for leadership are filled with the joy of offering the gifts they believe they have in the service of the country they say they love, why are so many so fiery mad, and not fiery glad? Why is it such a bitter cup? How would they sound if they saw making the country better as something they had the privilege to do, rather than something they had to do? In hindsight, it was clear that stepping on that freedom bus, as hard as it was, was something to rejoice rather than to lament. I wonder if that could be a lesson for the future rather than a commemoration of the past.